Asam Laksa is another popular dish in Malaysia. It is a dish with thick rice noodles served with a sour and slightly spicy fish based broth. Some of the key ingredients in this delicious soup include fish, Bunga Kantan or torch ginger flower, tamarind paste, dried tamarind or asam gelugor, daun kesum, etc. Blend the spice paste ingredients and set aside. Place the fish in steamer and steam on high heat for about 8 minutes, or until fully cook. When the fish is cool slightly, remove the skin, flake the fish and reserved the bones. Boil the fish bones with 6 cups of water, then lower the heat and simmer for about 30 minutes. When ready, strain the fish stock and discard the bones. Add blended spice paste, daun kesum, tamarind water, assam keeping, and bunga canteen into the fish stock. Bring it to a boil and simmer for 30 minutes. Then add half of the flaked fish and simmer for another 15 minutes. If the soup is too thick, add water, and season with salt. To serve: Place a portion cook rice noodles and flaked fish in a bowl. 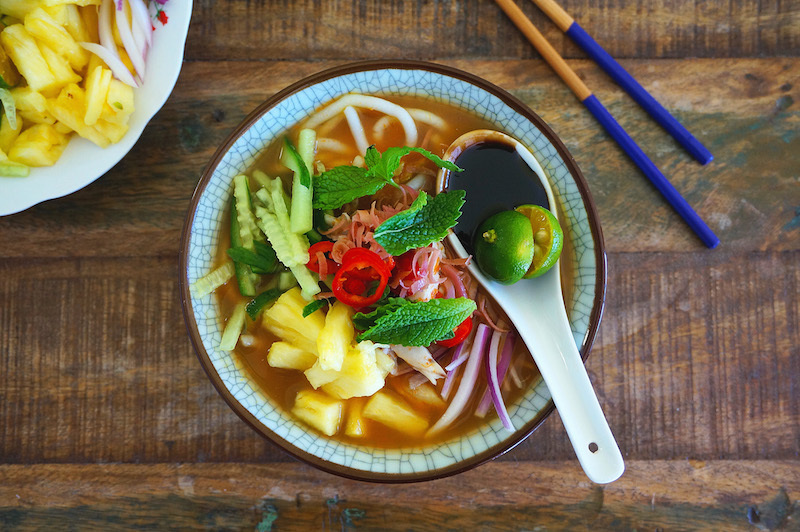 Then ladle the boiling soup onto the noodles, and top with pineapple, cucumber, red onion, mint leaves, red chilies, bunga kantan, and shrimp paste (hae ko), if using.